The popular music acts of the 1950s had a distinct advantage over the stars of previous decades. With the advent of network television in the late '40s, singers and bands were given an incredible outlet for mass exposure as music-based programs of the hourlong, half hour and quarter hour variety littered the daily listings in the pages of TV Guide and its many regional counterparts. When rock and roll caught on in the mid- to late-'50s, small screen comedy shows produced a few - but only a few - teenage singing stars. The first to make an impact was Ricky Nelson of The Adventures of Ozzie and Harriet, starting in 1957; his career as a singer and musician outlasted all who came afterwards. Yet in one minor regard, The Donna Reed Show surpassed Nelson's feat with not one, but two hitmaking young actors-turned-singers! The series premiered on ABC-TV in September 1958 as a vehicle for Oscar-winning actress Donna Reed, arguably the most glamorous of the era's beloved sitcom moms. At the start of the show's fourth season in September 1961, Gidget's former "Moondoggie" James Darren, an established artist with Colpix Records (part of Columbia Pictures and its Screen Gems TV production subsidiary), made a guest appearance singing "Goodbye Cruel World," which immediately scaled the charts in the way Nelson's records had been doing for more than four years. 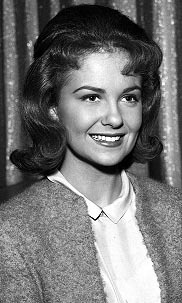 Producer Tony Owen (Reed's husband) decided to try the gimmick with the show's teen stars, 17-year-old Shelley Fabares (who played Mary Stone) and 16-year-old Paul Petersen (who played her brother Jeff). Both were self-conscious about their shortcomings as singers and nixed the idea, but Owen took a "do-it-or-else" attitude and set up studio time with Colpix A&R head Stu Phillips. Shelley was especially nervous about the prospect of forcing what she felt was a cackling, witchlike singing voice on millions of viewers, but she got a little more comfortable with the idea post-"Johnny Angel." Michele Marie Fabares wasn't the only showbiz member of her Southern Cal family; her aunt, Nanette Fabray (born Ruby Fabares) had performed at age four as "Baby Nanette," some 14 years prior to her film debut in the 1939 Bette Davis/Errol Flynn costume drama The Private Lives of Elizabeth and Essex. After changing her surname to the easier phonetic spelling, she became one of the multifaceted stars of early television, a top-notch singer, actress and comedienne with three Emmy Awards for her contributions to Sid Caesar's mid-'50s variety series Caesar's Hour. Niece Shelley 's first TV role came at age ten in a 1954 episode of anthology series The Loretta Young Show; the following year she appeared in Producers' Showcase and Matinee Theatre adaptations of the Thornton Wilder play Our Town and the century-old Emily Brontë novel Wuthering Heights as well as an episode of the sci-fi series Captain Midnight. She made her silver screen debut in 1956 playing Rock Hudson's daughter in Never Say Goodbye. After a brief moment in The Bad Seed, there was a part in the teen flick Rock, Pretty Baby starring Sal Mineo and John Saxon and its '57 follow-up Summer Love, the latter serving as an incognito introduction to cult rocker Kip Tyler, who supplied Saxon's singing voice as part of Jimmy Daley and the Ding-A-Lings, a fictional band that nevertheless had a few singles on Decca. In early 1958, Shelley was a regular player on Annette, a serial segment of Walt Disney's Mickey Mouse Club built around Annette Funicello that aired on weekdays during a four-week period. The Donna Reed gig started that fall; she became a teen idol without having to force her raspy-squawk singing voice on unsuspecting viewers. If only she could have heard herself as we do! The hesitant TV siblings made their recording debuts simultaneously with the cutesy-but-gagworthy "Very Unlikely" on the flip of Paul's novelty song "She Can't Find Her Keys" (the latter done music-video-style on the January 18, 1962 installment of the show). 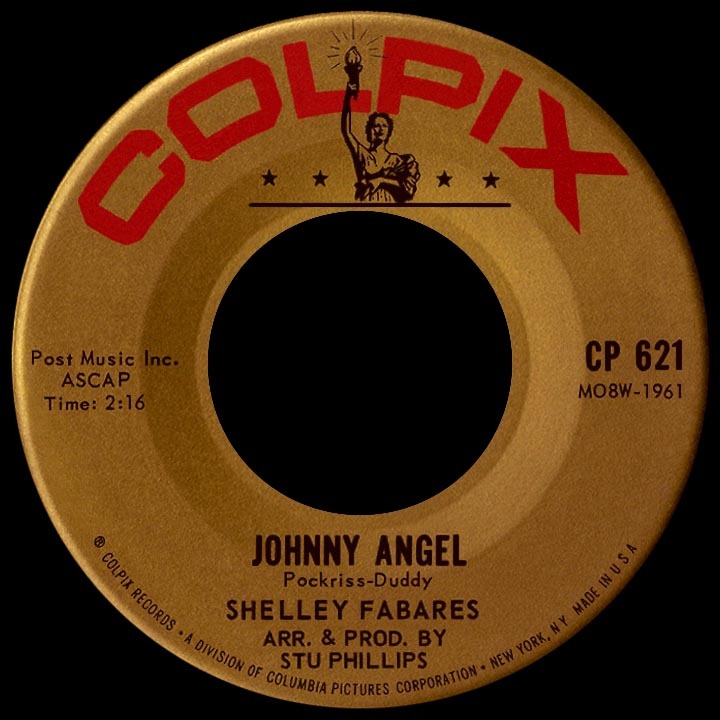 Shelley was guided through the task of remaking "Johnny Angel," written a few years earlier by Lee Pockriss and songwriter-TV producer Lyn Duddy and first released by Decca artist Georgia Lee in the spring of 1960. A tortuous process of editing and overdubbing was necessary to make Shelley's off-key singing halfway presentable (at least that's the story she has insisted on in interviews)...strange, since all my ears can detect is a vocal sound that's quite charming. Maybe backing group The Blossoms had something to do with smoothing out any howling-cat notes. She lip-synced the song two weeks after Paul's segment on the February 1 episode, Donna's Prima Donna. Both singles left the launching pad at the beginning of March; Shelley hit number one the first week in April and Paul's "Keys" was top 20 a few weeks later. Another young actor, 16-year-old Johnny Crawford of ABC's western series The Rifleman, joined the TV-teen crusade, hovering just below the top 40 with "Patti Ann" (two months later he went top ten with "Cindy's Birthday"). Colpix put out another Petersen-Fabares duet single, "What Did They Do Before Rock and Roll," a not-so-smooth novelty put-down of the music of unhip older folks. 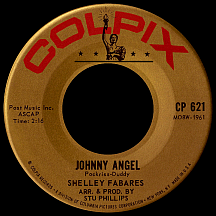 "Johnny Loves Me" was Shelley's obvious sequel; penned by Barry Mann and Cynthia Weil, it was probably one "Johnny" song too many (remember, Chuck told us all about "Johnny B. Goode" and Johnny got angry with Joanie and everyone knew what was up with "Frankie and Johnny"), yet made a respectable top 40 showing. Romantic teen tripe typified subsequent releases "The Things We Did Last Summer" (one of those lambasted "older songs" written by Jule Styne and Sammy Cahn) and "Telephone (Won't You Ring)," another Mann-Weil tune. Two albums of songs by the self-professed non-singer were joined by late-'62's Teenage Triangle, a compilation of the top hits thus far from Shelley, Paul and the several-years-older James Darren. "Ronnie, Call Me When You Get a Chance" (second phone song in a row, woe is me) reached the lower rungs of the charts in spring '63. That fall, when Mary left for college, her real-life counterpart wanted out of the series; Shelley made only a few more appearances through 1964. It was back to guest shots for awhile, on series like Mr. Novak, The Eleventh Hour, Arrest and Trial and The Twilight Zone. Two more singles appeared before year's end, the final one under the "supervision" of Lou Adler: "Football Seasons Over" was penned by future Bread leader David Gates and the flip, "He Don't Love You," was written by Jan Berry, Don Altfeld and Jill Gibson (later a fill-in Mama for Michelle Phillips). 20-year-old Shelley became Mrs. Adler a few months later. Adler cohorts P.F. Sloan and Steve Barri contemporized her sound on a 1964 single for Vee-Jay, "I Know You'll Be There." Shelley starred opposite Fabian in Ride the Wild Surf, which hit theaters just after she wrapped filming in Ft. Lauderdale, Florida on Girl Happy starring Elvis Presley. She made two singles for Adler's Dunhill Records before putting her singing career permanently on hold, a remake of The Platters' "My Prayer" in '65 and Sloan's "See Ya 'Round on the Rebound" in '66, the latter ironically suggesting she was finally getting more comfortable as a singer. The rock and roll movies kept coming: she went blonde in the 1966 Herman's Hermits vehicle Hold On! and long-haired brunette in the pilot for a weekly TV series based on the '44 classic Meet Me in St. Louis before romancing Elvis a second time in Spinout (with her Donna Reed Show dad Carl Betz again assaying his fatherly instincts). One more outing with Elvis, Clambake in '67, marked her place in history as his only three-time leading lady. Both she and the "Big E" had grown weary of the hackneyed formula his films had taken; she, at least, was free to move on to other things. Regularly appearing on drama and comedy series during the late '60s and '70s, she starred with James Caan in the Emmy-winning 1971 tearjerker Brian's Song and was a regular in a few short-lived series, The Brian Keith Show from 1972 to '74, Danny Thomas sitcom The Practice in 1976 and '77 and creepy-movie-parody Highcliffe Manor in '79. Crossing paths with auntie Nanette from time to time, the two worked together during the final season of NBC's long-running One Day at a Time; her character on the show had been a recurring one since the first season. It was all a far cry from her reluctant teen idol singing star phase of the '60s. M*A*S*H actor Mike Farrell became her second husband in 1984; she picked up two Emmy nominations playing Craig T. Nelson's better half on the ABC comedy series Coach from 1989 to 1997...the longest Shelley Fabares ever spent at one job!